Commercial flat roofing isn’t used as much as sloped roofing, but is becoming a lot more common. There are four main kinds of flat roofing. We’ll go over the advantages and disadvantages of all of them. 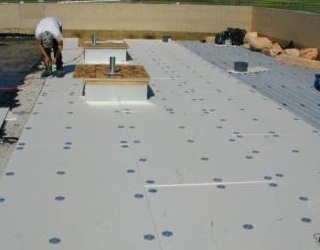 The expense of installing or replacing a flat roof can average around $250-$450 per sq. ft. and they’ll usually have a warranty that range between 10 and 20 years. But, the flat roof itself can have a lifespan of up to 25-30 years if its maintain regularly and properly. Single ply membranes are made of rubber, plastic or a combination of each. Its applied in a single layer. Installation is easier than other methods: roll the membrane out, weld the seams between the sheets with heat, chemicals or glue, then the attach the membrane to the roof with screws or flat plates, ballast (using something like rocks) or an adhesive. The rubber material is resistant to weather damage and sunlight. This commercial roofing system has a long lifespan and is durable due to being made of ethylene propylene diene monomer (EPDM). Advantages: Easy to install and very friendly to property managers and building owners when scheduling routine repairs. Its a light weight material, especially for the durability and weather resistant qualities it has. Its also fairly simple to patch leaks and small tears or holes. Disadvantages: Its one of the most expensive kinds of flat roofing system. The black color of the rubber will attract heat and can help warm your property in cooler months. You can have a lighter colored coating applied to reflect sunlight and heat away from your property, which can add up to 20-30 % more to the cost of the roof. An impregnated single ply material that comes in rolls, modified bitumen is a lot like like ice and water resistant shielding, only adding a mineral covered surface which reduces routine wear and tear upon it. Advantages: Its simple to install and also very friendly for property managers and building owners when it comes to maintenance. The color of the mineral surface is light so it reflects heat and sunlight away from your property, which will save you expenses through your monthly utility bills. The expense for this material is more than built up, but less than foam and rubber. Disadvantages: Should not be installed in occupied properties because the torch-down method can be a fire hazard. It’s also not as damage resistant as rubber membrane or foam roofing types. Foam is sprayed straight onto the roof, where it “foams up” and hardens before a protective coating is put on top. Advantages: Because of its flexibility, foam is especially great for a roof that has unusual shapes and configurations. Foam has several unique advantages over other types of flat roofing systems. It protects against thermal shock and it can greatly reduce your energy bills due to its superior insulating capabilities. Its very light weight and easy on your buildings structure. 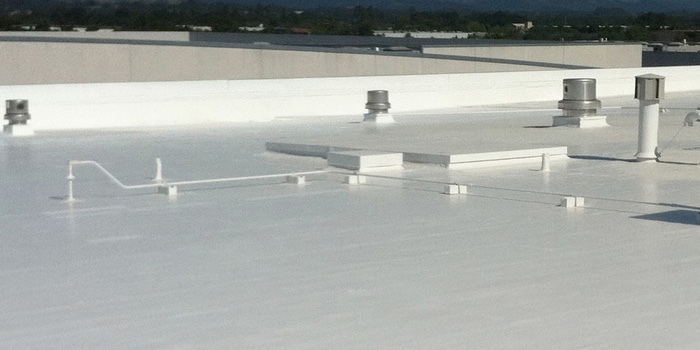 Disadvantages: Foam roofing is the most costly of the commercial flat roofing systems. Built up roofing has several layers of waterproof roofing materials that uses hot tar, gravel and ballast made from crushed rock. Installers are incorporating more and more technologically advanced materials and techniques as they originally consisted of just tar paper. Advantages: The use of gravel is great for reducing fire risk. This is the most affordable of all the flat roofing systems. Disadvantages: The weight of this roofing material may force some reinforcement of your property’s frame, mainly the joists, in order to be able to support this type of commercial roof. Installation can be messy and there are some toxic qualities that can make it hard to be installed on buildings while they’re being used by the occupants or customers. At Armadillo Roofing & Exteriors. 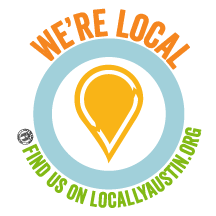 we provide commercial flat roof repair, commercial flat roof replacement and commercial flat roof installation in Austin and all its surrounding communities. We take every step necessary to protect your building and property during the roofing process. Our professional, experienced crews do a great job of cleaning up the work area each day. If you need advice on any of your commercial roofing needs, give us a call at 512-333-7663.